Could you change from off-peak electricity tariff 2 to 1, without running out of hot water? If so you could save yourself a third off your hot water costs. Your hot water costs are itemised on your electricity bill, as a 'controlled load'. Homes we find on off-peak tariff 1, do not report running out of hot water. Whether off-peak tariff 1 is suited to your home, depends on the amount of hot water used and at what time of the day. Ask yourself when you use hot water. Is it in the morning, afternoon or evening? Off-peak tariff 1 is active at night time for approx 6 hours. Tariff 2 has the same active period with an additional 3 hours in the day, usually in the afternoon to boost the water temperature, before people start arriving home. So if this sounds like your home, then tariff 1 may not be suited. The time off-peak electricity is active, may change with electricity providers. 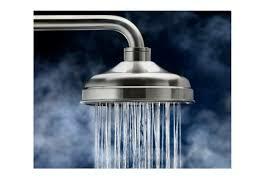 To work out how much hot water you may use in the shower, set the shower to your normal temperature. Turn off the cold and collect the hot water in a bucket for thirty seconds. Now using a little simple maths, if you have a five minute shower, multiply the litres in the bucket, by ten. Some variable shower heads have settings written on the side, as to the amount of water being used per minute. A common shower head is nine litres per minute. For other appliances, the amount of water used can be found in appliance manuals, or by calling the distributor of the appliance. Let us say you use 30 litres of hot water in the morning and you have a 315 litre hot water tank. This is not a lot of water out of the tank, only around 11% and should not create to much of a temperature drop. Having a hot water tank inside the home, will mean less electricity is used, as during the winter, the outside hot water tank can get very cold during the night and use considerable more electricity than one sited in the home. Other important factors on the cost of your hot water are the thermostat setting. A normal setting for the average home is 60 degrees centigrade. In some cases this can be even less. Anything over this temperature will be costing you in electricity costs. Unless you have a specific reason for your water being higher, we would suggest you have it set to 60 degrees centigrade. When setting the water to less than 60 degrees centigrade, make sure that the water is still warm enough to reach the furthest distance, from the hot water tank. A long run in the home, may be a reason for the water being higher, than 60 degrees centigrade. We would say if this is the case, make sure the pipes are insulated first. As this will be the cheaper option over time. A common finding is for homes to be on off-peak hot water tariff 2 when there are children at home. Once gone, the tariff can switched back to 1. This is often forgotten! Making sure you are on the best hot water tariff, with the correct temperature setting, so you can save on your hot water costs.